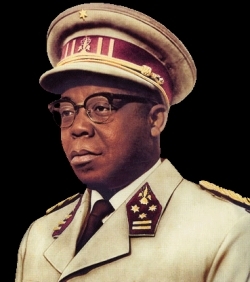 Joseph Kasavubu was the first president of the Republic of Congo, serving from 1960 to 1965. He assumed the office when the Congo became independent from Belgium on June 30, 1960. The date and year of his birth is not certain but it is believed to be around 1910. He was born in the village of Kuma-Dizi in the Mayombe district of the Lower Congo region. Kasavubu was a member of the Bakongo ethnic group. Kasavubu did not know his father and lost his mother at the age of 4. He was raised by his older brother who sent him to a nearby Catholic mission where he was baptized in 1925. Kasavubu attended mission schools and then between 1936 and 1939 attended a seminary where he received the equivalent of an undergraduate degree. He took a teacher’s certificate and worked in mission schools. In 1942, Kasavubu received a bookkeeping job with the Belgian colonial administration, which was at the time one of the highest positions available to a black Congolese. Joseph Kasavubu entered public life in 1946 when he was elected secretary of his alumni association. In 1954 he was elected president of the Alliances des Ba-Kongo (ABAKO), the Bakongo tribal association. Kasavubu transformed ABAKO into a political party, which was an influential political party of the Bakongo ethnic group. Three years later, in 1957, the ABAKO party won all the offices available for black Congolese politicians in the first municipal elections allowed by Belgian officials in the capital city of Leopoldville. Kasavubu subsequently became mayor of the city. Kasavubu, never a firm supporter of independence, nonetheless headed the second largest political party in the Congo. The largest party, Movement Nationale Congolais (MNC), headed by Patrice Lumumba, nonetheless reached out to him as the colony moved quickly toward independence in 1959 and early 1960. Lumumba endorsed Kasavubu for the Presidency while he became the nation’s first Prime Minister. The two men worked in an uncomfortable partnership from June 30, 1960, when the Congo became independent, until September 5 of that year when Kasavubu dismissed Lumumba, beginning a period of political unrest that led to the former Prime Minister’s assassination on January 18, 1961. For the next four years Kasavubu survived in office by successfully mediating between both local and international factions in what would become the Congo Civil War. The conflict took an estimated 100,000 lives and involved military intervention by the United Nations and Cold War rivalry between the United States and the Soviet Union as pro and anti-Communist factions vied for control of the nation. On November 25, 1965, Army Chief of Staff Joseph Mobutu overthrew Kasavubu and created a military dictatorship that controlled the nation for the next three decades. Joseph Kasavubu retired to a farm in Mayombe where he died on March 24, 1969. Crawford Young, Politics in the Congo: Decolonization and Independence (Princeton: Princeton University Press, 1965); Crawford Young and Thomas Turner, The Rise and Decline of the Zairian State (Madison: University of Wisconsin Press, 1985); Kevin Shillington, Encyclopedia of African History (New York: Fitzroy Dearborn, 2004); http://www.search.eb.com/eb/article-9044787.